A native tree commonly found in dry woodland, it has spines on the stem until it is 1-2 m tall. The leaves vary in size from about 1 cm long to about 3 cm long on plants that are 2-3 m tall, the narrow leaves are whitish on the undersurface because of hairs. 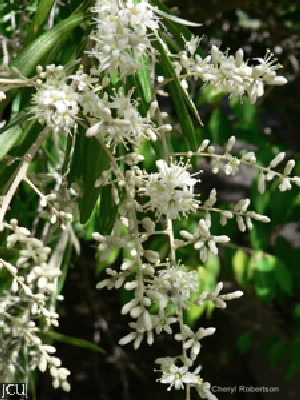 The white 5-petalled flowers are borne in erect panicles on the end of branches. The fruit is a 2-valved flattened brown capsule. Flowering February – March.